COLUMBUS, Ohio– For the majority of the first month of the season, the Columbus Blue Jackets sat outside the win column looking in. Not a single win to be had. Injuries mounted, a suspension was served, coaches and players met on numerous occasions, it just seemed to get worse with every passing day. 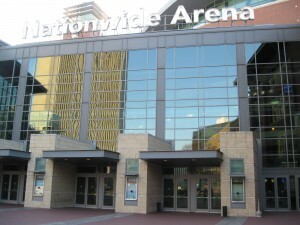 Tonight the Columbus Blue Jackets entered the Nationwide Arena in downtown Columbus, with hopes of grabbing their first victory of the season and putting an end to a nightmare that has lingered since the drop of the puck in game one of the 2011-12 season. The Blue Jackets who welcomed defensemen James Wisniewski to the lineup after serving and 8-game suspension scored twenty-one seconds into action, Pittsburgh native RJ Umberger cashed in with his first goal of the season beating backup goaltender Ty Conklin, with helpers coming from winger Antoine Vermette and rookie winger Ryan Johansen. Umberger surely lifted a bench just looking for confidence. Conklin was between the pipes tonight for starter Jimmy Howard who was excused from the team for family reasons. Several minutes later the Red Wings tied the game at one with a goal coming off the blade of winger Darren Helm. Helm on the board for the first time this season, with assists coming from forwards Justin Abdelkader and Todd Bertuzzi. The Blue Jackets needed to continue to apply early pressure on the Red Wings, with hopes of eventually regaining the lead. They did just that four minutes later as Ryan Johansen found his first goal of the season and first in the National Hockey League, coming on the power play from defensemen Grant Clitsome and Kris Russell. The Blue Jackets carried a 2-1 lead into the 2nd period. Over half way through the 2nd period, recently summoned from the Springfield Falcons of the American Hockey League, defensemen John Moore found the back of the net for his first goal in his NHL Career in just his 3rd NHL game played. Winger Cody Bass and defensemen Grant Clitsome added the assists on the Blue Jackets 3rd tally of the game. And finally, with just under a minute to go in the final frame, the Columbus Blue Jackets secured two points in the win column on an empty net goal by winger Derek MacKenzie. MacKenzie, his first from RJ Umberger and Grant Clitsome. Starting goaltender Steve Mason turned aside 30-31 shots faced to earn his 78th victory in his career and as a Columbus Blue Jacket. Ty Conklin finished tonight’s game with 28 saves losing his second game of the season for the Red Wings. A victory at last. A well deserved two points in the win column at home. The Blue Jackets will hit the road tomorrow for Buffalo, NY, for a matchup on Thursday night against the Buffalo Sabres at the HSBC Arena.